My lack of experience taking the train in Japan shone through majestically as the first train I hopped on… I took in the wrong direction. Its very funny now looking back and it’s one of those memorable mistakes that become so permanently scorched in your brain that you would NEVER do it again. So after coming off at a station I couldn’t even pronounce properly I fiddled with my gadgets to try to figure out how do I get back on track. My brain short-circuited due to a potent mixture of nervousness, anxiety and fatigue but after 30 minutes of fumbling I eventually made it to the station master as my brain continued to not function when I tried to speak to him using my very limited Japanese. Then he said, in the most awesome almost perfect English ever “Did you take wrong train? Let me see your ticket. Oh! 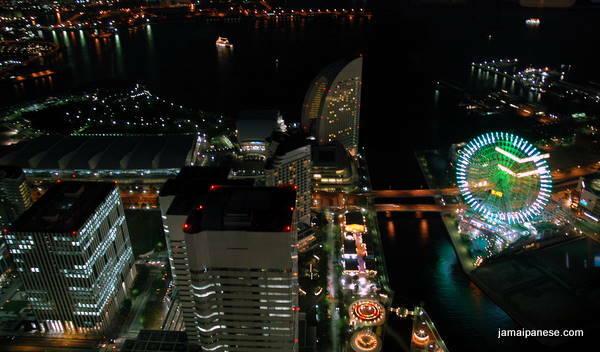 you need to take the stairs down then go up on the escalator to the opposite track and take the limited express to Yokohama and connect to the Minato Mirai there”. My mouth was unknowingly ajar as he spoke as I wondered if he was a mind-reader, a ninja or both. 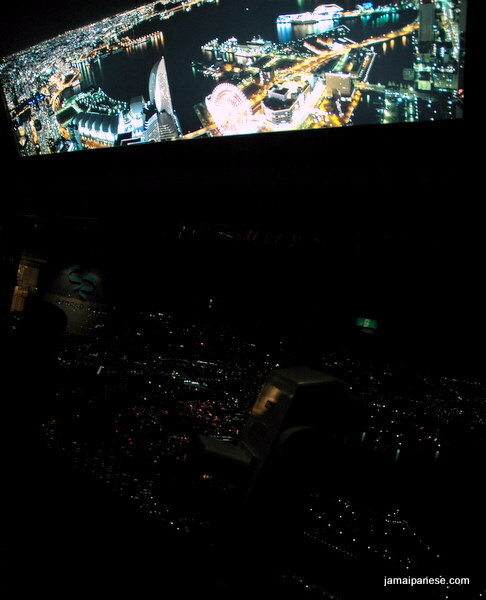 I followed his instructions and finally arrived in downtown Yokohama over 2 hours late, camera in hand and feet in motion as I tried to see what I could still do as photographing the skyline in the perfect light was no longer an option because it was dark! Like a true relative of King Kong my instincts took me to the tallest building in the concrete jungle – The Landmark Tower. 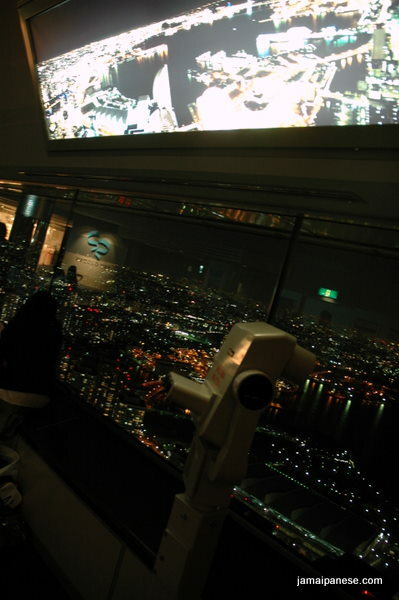 After passing a whopping 1000 yen to a smiling cutie I was escorted to an elevator that nearly popped my eardrums and I chuckled to myself when I came off on the “69”th floor, I had arrived at the Sky Garden, almost 300 meters up. Suddenly getting lost was all part of the plan as the nightime views of the city were really spectacular. Lots of tourists were around too, Indians, Koreans and even some Canadians. I took some photos, most of which are not very good due to the poor light and my shaking hands.I made it back to home base without incident and I am happy to report that I never took a a train in the wrong direction again during the rest of my stay in Japan and probably NEVER will make that mistake again. Heh…even after living there for 3 years I would still take the wrong train/direction now and then when visiting unfamiliar places. Next time you’re going? Pack me in your suitcase. if you can survive a day worth of flights in a cargo hold? sure! Just pack nuff Excelsior water crackers, and some WATA, and I’m good. I think its only expected that you got lost once but what wonderful treasures you were able to see. I look forward to my first visit to Japan. When you first started raising funds to go to Japan, it motivated me to get started for my trip! awesome!!!! When do you plan on going? Within the next two years. I want to spend almost as much time as you did. I don’t think one week would be enough time for me. I will be saving the money myself. The plan is to go there for my honeymoon. I just have to convince my sweetie. He’s not as keen upon going to Japan as I am. I am crossing my fingers that the proposal regarding a free trip there goes through because I will be putting my name in the hat! Your experience is like every nightmare I’ve had about Japan. Walking around having no idea where I’m going, dazed and confused and fumbling with technology to find my way back. This just makes me want to go to Japan even more now. As soon as I start working again I shall begin saving up the funds to take a Japanese vacation.